Pipeline Safety - Summit Utilities Inc.
Transportation by pipeline is the safest form of energy delivery the country. In fact, natural gas pipelines transport approximately one-fourth of the energy consumed in the U.S. and is delivered to customers through a 2.5 million mile pipeline system. At Summit Natural Gas, safety is our #1 Priority and we take every possible step to ensure the safety and reliability of our natural gas systems. When planning to dig or excavate for any type of build (fences, digging for drainage ditches, home additions etc. ), CALL 811 to ensure no pipelines or other underground utilities are hit during any digging or excavating activities. Pipeline markers should always be respected. Markers are used to show the approximate location of natural gas pipelines running throughout a specific area. They also contain important information such as, the type of material running through the pipeline, name of the operating company, as well as company contact information. Third party excavation is still the main cause for pipeline incidents. If you suspect any illegal digging, contact law enforcement authorities immediately. If pipeline damage occurs or you suspect any pipeline damage, no matter how minor the damage may appear, please notify us immediately at 1-844-528-5520. We will need to evaluate any and all damage to make any necessary repairs and ensure your safety. During a pipeline accident, pipeline operators follow specific procedures and rules to address the situation. They are solely responsible for closing and opening valves and shutting off gas service. Please cooperate with pipeline operators and if you have any questions, please contact us immediately. IF YOU BELIEVE YOU HAVE A NATURAL GAS EMERGENCY, CALL 800-909-7642 RIGHT AWAY! BLOCKED SEWER? YOU MAY BE DEALING WITH A CROSS BORED SEWER LINE! 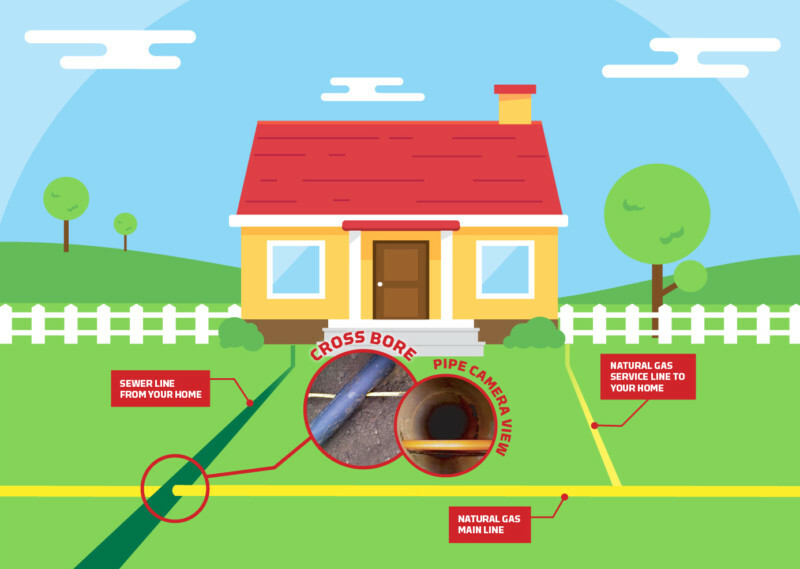 For many years, utilities nationwide have installed gas pipelines by boring underground, rather than digging trenches, to avoid tearing up paving and landscaping. Existing underground pipes and wires are marked, when possible, before work begins. But sewer pipes often go unnoticed because they are regularly unmapped and are undetectable using above-ground locating devices. Crossbores are a rare side effect that can happen when the machine used to install gas pipelines inadvertently bores through sewer lines. Call or ask your sewer clearing professional to contact Summit Natural Gas of Maine at 1-844-528-5520 prior to clearing the blockage. We will promptly meet your professional to locate and mark our natural gas pipeline free of charge. Never use a sewer clearing machine to clear an interior blockage until the obstruction has been identified. Suspect a gas leak? Leave the area immediately and call Summit Natural Gas of Maine or 911. Do not use phones near the gas leak. Before anyone clears an interior blockage, by chemical or mechanical means, call Summit Natural Gas of Maine at 1-855-460-0021 for immediate assistance.